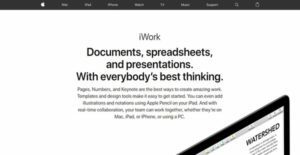 iWork is a simple suite of office productivity applications designed for home and business use. The suite of office programs is developed by Apple Inc., the world’s largest information technology company in terms of revenue and one of the leading manufacturers of mobile phones in the market. The office suite is exclusively built for macOS and iOS operating systems, although it can also work on different platforms via the iCloud website. iWork provides Mac and iOS device users with the capability to create amazing works and projects in the best possible ways. It also helps them collaborate in real time, enabling team members to connect with each other and work together, regardless if they are using a Mac computer, iPad, or an iPhone. iWork is comprised of three programs; a word processing and desktop publishing program, a spreadsheet application, and a presentation tool. With iWork, users will be able to create sensational-looking documents effortlessly; organize, animate, and visualize data; and design beautiful slides and other presentations with stunning graphics, animations, and effects. Pages is the name of iWork’s word processing program. With this tool, anyone can create gorgeous and sensational-looking documents in just a matter of minutes. Creating such documents using the tool is so easy. This is because it comes with pre-made built-in templates that are designed by Apple. Thus, to create reports, digital books, posters, or CVs; users simply need to select from these templates and modify whatever template they selected. However, they can also start from scratch or a blank document and make their own design. To create beautiful documents, Pages enables users to enhance their documents by adding shapes to them. The tool offers over 500 shapes which can be edited. In addition, they can insert photos, charts, music, videos, and movies to their documents. Pages also makes it possible for users to collaborate in real time as they create and enhance their documents. Team members can work on the same documents all together at the same time. They can share documents publicly or have their documents accessed by only selected individuals. As they work on the documents, the program permits them to view those ones that are currently working with them on same documents. The word processing program is equipped with advanced tools. For instance, as users edit documents they can mark up their edits so they can easily track the changes they have made. There is also a tool that they can use for creating master pages so they can achieve design consistency across the layouts of their documents. They will be able to add mathematical equations to documents as well. iWork has a spreadsheet application named as Numbers that lets users create and design spreadsheets for their home budget, checklist, invoice or mortgage calculator. They can quickly start creating spreadsheets by selecting from its collection of more than 30 Apple-designed templates. In order for them to animate their data and create gorgeous spreadsheets, users can insert tables, charts, texts, and images to the free-form canvas. Once they added tables, they will be able to customize their look by applying custom cell border styles. Preset styles can also be applied to texts, shapes, and images. Additionally, Numbers includes a feature that automatically provides function suggestions as users type formulas. It has a smart view feature that gives them the ability to see formula results and check errors live. iWork provides a presentation program called Keynote which makes it so simple for users to produce and deliver stunning presentations. Likewise, this tool utilizes pre-made presentation templates where users can select any theme they want. In addition, the tool comes with a slide navigator that enables them to quickly navigate through their presentations. As they skim through their presentations, the slide navigator permits them to add new slides and rearrange the slides. Keynote provides users with the ability to apply cinema-quality animations to their presentations. As an example, it has a feature known as Magic Move effect which is used for animating and morphing objects and graphics effortlessly. Stunning slide transitions are also available within the program such as Clothesline, Object Cube, Object Flip and Object Pop. Keynote, moreover, provides flexible options as users deliver their presentations to their audiences. They can include recorded narrations to their presentations as well as create interactive shows that run on their own for different kiosks and displays. iWork is designed both for Mac computers and iOS devices. Because of this, it offers features and capabilities that are exclusively built for iOS device users. For instance, its word processing and presentation tools allow users to draw and annotate from their iOS devices using Apple Pencil or their fingers. They can also deliver their presentations directly from their iPad, iPhone or iPod Touch. Meanwhile, as they access its spreadsheet tool on their mobile devices, again by just using their fingers, they can rearrange columns and rows and resize tables within the spreadsheets. Thus, they simply need to touch and drag columns and rows and lines around tables. Also, they can double-tap a cell so that an intelligent keyboard will pop up which can help them easily enter texts, formulas, and more. The office suite integrates with iCloud, a cloud storage and cloud computing service which is also developed by Apple Inc. As a result, documents, spreadsheets, and presentations can be accessed on any browser-enabled device. Thus, users will be able to access and edit their works using any web browser, and they won’t be restricted regardless of whatever device they are using; be it a Mac, iPad, iPhone, or iPod Touch. Additionally, with this capability, they can keep their documents, spreadsheets, and presentations synchronized and up to date across multiple devices. If you are interested in iWork it might also be a good idea to investigate other subcategories of Best Office Software gathered in our database of SaaS software reviews. Since each enterprise has specific business needs, it is prudent for them to refrain from seeking a one-size-fits-all faultless software solution. Needless to say, it would be futile to try to find such an app even among market-leading software solutions. The smart thing to do would be to list the various important aspects that need consideration such as required features, budget, skill levels of workers, company size etc. Then, you should do your groundwork thoroughly. Read some iWork reviews and investigate each of the other systems in your shortlist in detail. Such comprehensive research can make sure you reject ill-fitting systems and zero in on the solution that offers all the elements you need for business success. How Much Does iWork Cost? We realize that when you make a decision to buy Office Software it’s important not only to see how experts evaluate it in their reviews, but also to find out if the real people and companies that buy it are actually satisfied with the product. That’s why we’ve created our behavior-based Customer Satisfaction Algorithm™ that gathers customer reviews, comments and iWork reviews across a wide range of social media sites. The data is then presented in an easy to digest form showing how many people had positive and negative experience with iWork. With that information at hand you should be equipped to make an informed buying decision that you won’t regret. What are iWork pricing details? What integrations are available for iWork? If you need more information about iWork or you simply have a question let us know what you need and we’ll forward your request directly to the vendor.